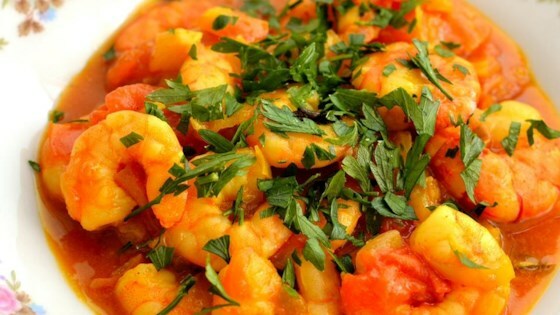 "This is a delicious prawns curry. If you want, you can substitute boiled eggs for the prawns. Serve the curry with naan, roti, or plain rice." Stir the rice flour, turmeric, and salt together in a bowl; add the prawns and turn in the flour mixture to evenly coat. Heat 3 tablespoons oil in a large skillet over medium heat; fry the cumin seeds in the hot oil until they splutter. Add the onions, green chile peppers, and ginger-garlic paste; cook until the onions are browned, about 5 minutes. Stir the pureed tomato, Kashmiri red chili powder, garam masala, and ground cumin into the mixture. Season with salt and continue cooking until the gravy thickens and the oil is released, 10 to 15 minutes. Pour the cream into the skillet and stir; lie the prawns into the mixture and continue cooking until the prawns are cooked through, 3 to 5 minutes more. Garnish with the cilantro to serve.